Dawson County lies on the eastern edge of Llano Estacado on the southern High Plains. The land, surfaced with sand and loam, comprises 902 sq. mi. of rolling prairie that drains to the playas. The county is named after Nicholas Mosby Dawson, a hero during the Texas Revolution. Lamesa is the county seat. Oil production in Dawson County reached its peak in 1996 – 1997 in which more than 8,045,275 barrels of oil were produced. As of August 2014, 436,734 barrels of oil and 279,219 million cu. ft. of gas were produced. In 2011, 150 drilling permits were approved, reaching an all-time high. In its entire oil production history, Dawson County has already 5,352 drilled wells; 89 companies have been operating in the county. Top producing operators include Chevron USA Inc., Devon Energy Production Co. LP, Diamondback E&P LLC, Endeavor Energy Resources LP, and Fasken Oil and Ranch Ltd.
Gelin, Leona M., and Mark Odintz. 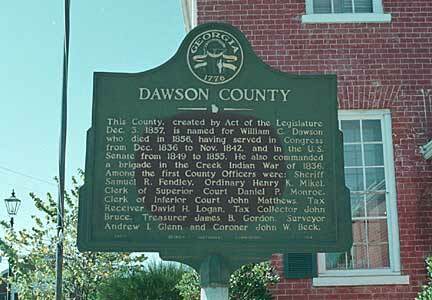 “DAWSON COUNTY.” Handbook of Texas Online. Texas State Historical Association, 12 June 2010. Web. 31 Jan. 2015. <http://www.tshaonline.org/handbook/online/articles/hcd03>. “Oil Wells and Production in Dawson County, TX.” Dawson County, TX Oil Wells, Operators, and Production Data. Texas Data Applications, LLC. Web. 31 Jan. 2015. <http://www.texas-drilling.com/dawson-county>. Dimmit County comprises 1,307 sq. mi. of generally flat to rolling terrain in southern Texas. The county is rich in cacti, mesquite, and scrub brush. Carrizo Springs is the county’s seat and the largest town located in the northwest. 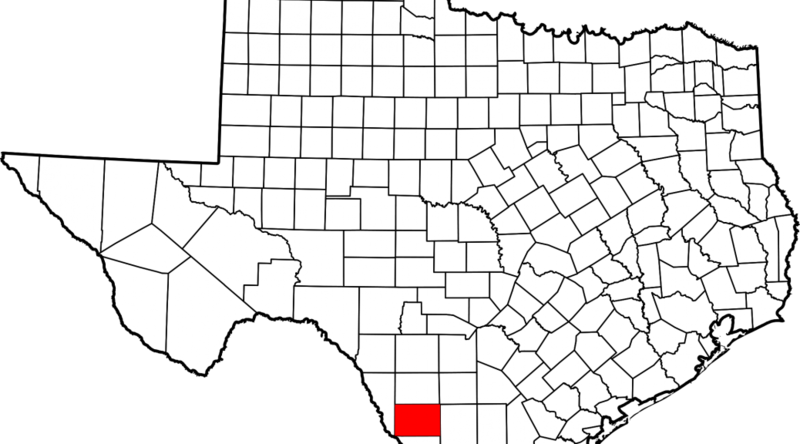 Bordered by La Salle, Webb, Zavala, and Maverick counties, Dimmit County was named after one of the framers of Goliad Declaration of Independence, Philip Dimmitt. There are currently 1,554 producing leases and 59 producing operators. Approval of drilling permits reached its highest in 2012, while oil production reached its highest in 2014. That same year, 2,992,876 barrels of oil were produced and potential for growth is seen. In its entire history of oil production, Dimmit County has 8,130 drilled wells. Anadarko E&P Onshore LLC, Blackbrush O&G LLC, and Chesapeake Operating Inc. are the three top producing operators in the county. 056536 BAXTER, KELLY H. OIL AND GAS CO.
Leffler, John. “DIMMIT COUNTY.” Handbook of Texas Online. Texas State Historical Association, 12 June 2010. Web. 31 Jan. 2015. <http://www.tshaonline.org/handbook/online/articles/hcd09>. “Oil Wells and Production in Dimmit County, TX.” Dimmit County, TX Oil Wells, Operators, and Production Data. Texas Data Applications, LLC. Web. 31 Jan. 2015. <http://www.texas-drilling.com/dimmit-county>. the wellbore and the oil formation through perforation tunnels and the surrounding cement sheath. The quality and quantity of the tunnels have a direct influence on well productivity. Therefore it is crucial that completion engineers should ensure that wellbore perforations are located in the right places, oriented correctly, deep, and clean. Effective perforation design and execution process facilitate natural flow and easy pumping of oil, exclude water from the overlying or underlying units, and keep formation rock particles out of the well. In order for a wellbore to be productive, the casing and cement are perforated to allow the oil and gas to enter the wellstream. In case of cased-hole completions, casing is required to be run into the reservoir. Perforating equipment are transported to and operated at the site by a specialized crew. The tools are then assembled upon arrival to the site. A wireline, slickline, or coiled tubing runs a reservoir-locating device and a perforation gun into the wellbore. Upon reaching the perforation reservoir level, the gun shoots holes to the sides of the well to allow oil and gas to enter the wellstream. Perforations are created by either firing bullets into the sides of the casing or discharging jets/shaped charges into the casing. 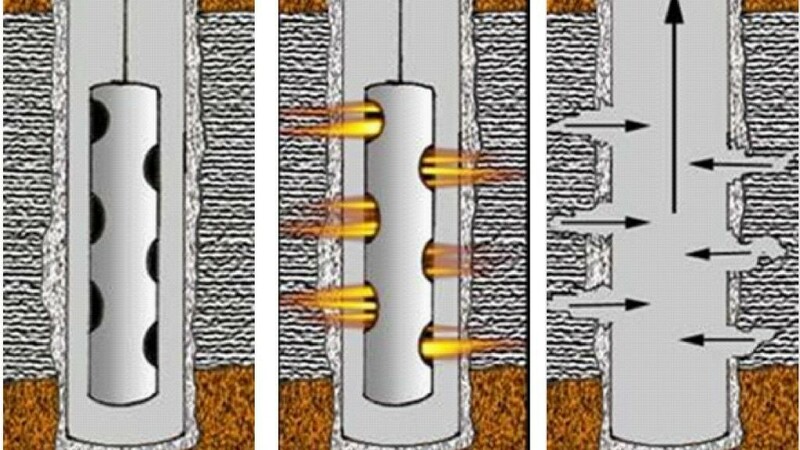 Locations of perforations are determined previously using drilling logs, although intervals cannot be easily located through casing and cement. To solve this problem, a gamma ray collar – correlation log is implemented to correlate with the initial log run on the well and define the locations where perforation is needed. Perforation almost always involves use of explosives, and surface detonation poses a great risk to the lives of drillers. Before starting the perforation, keep all non-essential personnel out of the site and post warning signs. Prohibit the use of communication gadgets or navigational systems, and shut down non-essential electrical systems during gun-arming operations. Operations involving explosives should only be performed under the direct supervision of the special services supervisor. Remnants of explosives should be reported to the aforementioned supervisor. Behrmann, Larry, and Chee Kin Kong. “The Search for Perfect Perforations.” Schlumberger. Schlumberger Limited, 2014. Web. 19 Dec. 2014. <https://www.slb.com/~/media/Files/resources/mearr/…/perforations.pdf>. “How Does Well Completion Work?” Rigzone. Dice Holdings, Inc., 1999. Web. 19 Dec. 2014. <https://www.rigzone.com/training/insight.asp?i_id=326>. “Oil and Gas Well Drilling and Servicing ETool.” Occupational Safety & Health Administration. U.S. Department of Labor. Web. 22 Dec. 2014. <https://www.osha.gov/SLTC/etools/oilandgas/servicing/special_services.html>. A steel pipe, or casing, is run into the wellbore before an L-shaped cementing head is fixed on top of the wellhead to receive the slurry. Two wiper plugs, the top and bottom plugs, sweep the inside of the casing and prevent the slurry and drilling fluids from mixing. The bottom plug is introduced into the well before the slurry is pumped into the well behind it. The bottom plug, which works as a one-way valve that allows the slurry to enter the well, is caught just above the bottom of the wellbore by the float collar. As cement is pumped into the wellbore, pressure is increased until a diaphragm is broken within the bottom plug. This allows the cement to flow through the casing and up outside the casing string. After the proper volume of slurry is pumped, a top plug is pumped into the casing to push the remaining slurry through the bottom plug. The pumps are turned off once the two pumps reach each other, and the slurry is allowed to set. Pumpability time is the amount of time it takes for the slurry to set. Special types of cement are used to set wellbores at deep depths, under high temperature and pressure, and in corrosive environments. “How Does Cementing Work?” Rigzone. Dice Holdingd, Inc., 1999. Web. 19 Dec. 2014. <https://www.rigzone.com/training/insight.asp?insight_id=317&c_id=1>. Cementing is another stage in well completion that prepares a wellbore for further stages. 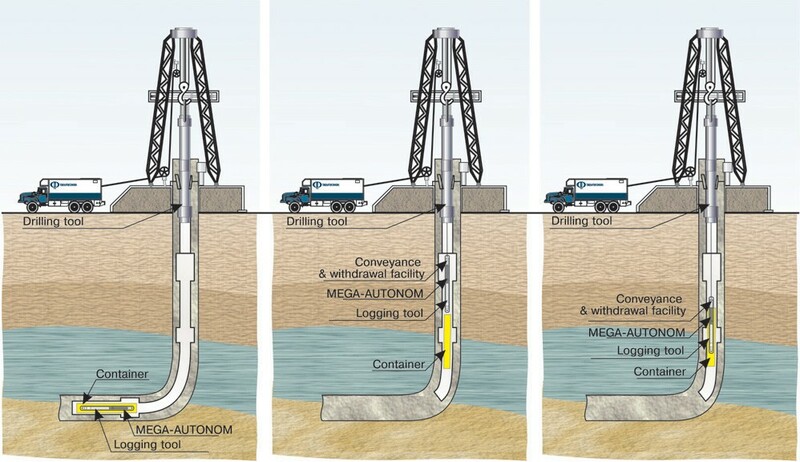 The operation mainly involves development and pumping of cement into place to protect and seal the wellbore. This way, non-hydrocarbons, especially water, can be prevented from penetrating into the well. Cementing is used for other purposes, to seal the annulus after a casing string has been run into a well, to seal an area where flow has been reduced or absent (also known as lost circulation zones), to plug an existing well to control its flow, and to plug an abandoned wellbore. To displace existing drilling fluids and to fill in the space between the casing and the sides of the drilled well, cement slurry is pumped into the well. The slurry is composed of a special mixture of additives and cement, and is left to harden to seal the well from non-hydrocarbons that might try to enter the wellstream. This is also to ensure that the casing is positioned permanently into place. To determine the amount of cement needed, the diameter and the depth of the borehole are measured using a caliper log. Multifinger caliper logs measure the diameter at various locations using mechanical and sonic means to accommodate irregularities and to determine the volume of the openhole. There are various types additives mixed into the slurry: accelerators can shorten the setting time for the cement, while retarders can prolong its setting time. On the other hand, lightweight and heavyweight additives can decrease or increase the density of the slurry. Other additives can transform the compressive strength of cement, its flow properties, and its dehydration rates. Bridging materials are added to plug lost circulation zones and antifoam additives are included to prevent foaming within the well. Cost reduction efforts call for the use of extenders. 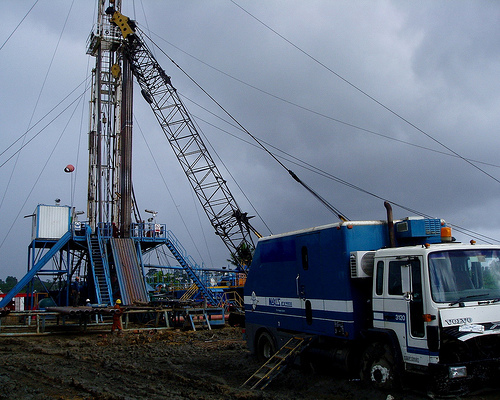 Wireline operations are part of special services in the oil and gas industry. The operations include slicklines and electric lines utilized for perforating, logging, bailing, downhole tool setting, fishing, swabbing, and other workover efforts. A wireline, also called electric line, is an electric cable used to transmit data regarding the conditions of the wellbore and to lower tools into it. It may consist of single or multi-strand cables that are braided. Aside from gathering data for other workover tasks, wirelines are also used to perform wireline logging. Slicklines A slickline is a thin non-electric cable inserted into a well to deliver and retrieve wellbore tools like gauges, plugs, and valves. It can also be used to adjust valves and sleeves located downhole, and to repair tubing within wellbore. Wrapped around a drum at the back of a truck, the slickline is raised and lowered into the well by reeling the wire in and out hydraulically. Wireline logs measure properties of well formations using electric lines. They were first developed by the Schlumberger brothers in 1927. 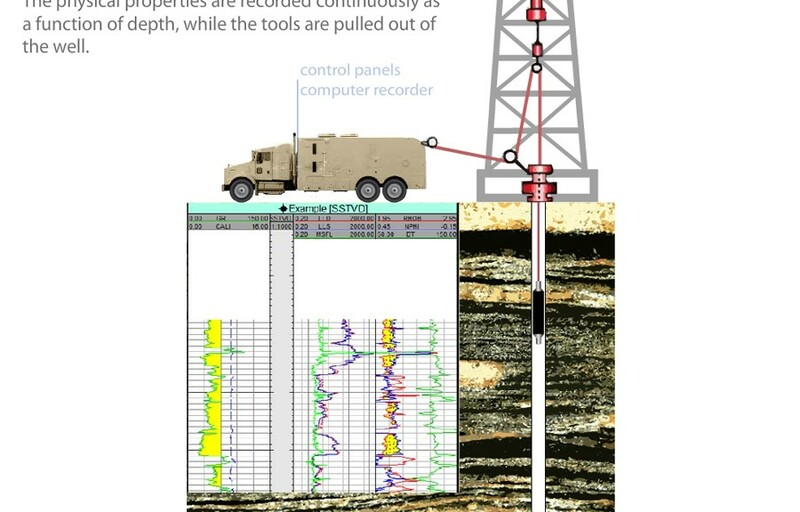 Wireline logs are constant downhole measurements sent through wirelines to help drillers, engineers, and geologists make real-time decisions about drilling operations – quite different from MWD and mud logs. Wireline logs assess wellbore dimensions and sonic properties, and can measure conductivity, resistivity, and formation pressure. The logging tool called a sonde is located at the bottom of the wireline. Measurements are taken by lowering the wireline to the prescribed depth and then raising it out of the well. In an effort to sustain tension on the line, measurements are continuously taken on the way up. Permit approval in Cochran County peaked in 1990 and in 1994 when more than 100 permits were approved for those years alone. The lowest recorded approval rate in the county occurred in 21998 when just under 20 permits were approved. The approval rate this year is just a little better with an approval more than 20 permits. The companies that filed the most number of permits in the area include A.C.T. Operating Company; Silver Creek Oil & Gas, LLC; Apache Corporation; and Tema Oil and Gas Company. The highest production in the county occurred in 1993 when more than 7,367,000 barrels of oil were produced. This number, however, has been on a decline ever since, with the worst performance in terms of oil production occurring this year with a production of only a little over 2,946,800 barrels of oil. Since the start of its operations, some 434 operators have gone into its territory. 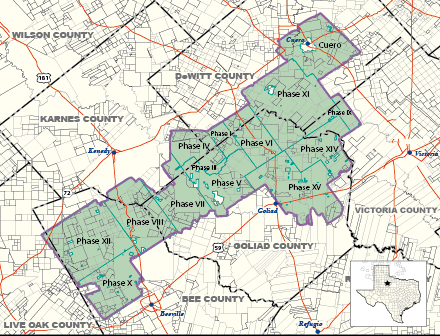 The top leases in the county include the Boyd Oil Lease #005907; Dean, C.S. “A” Oil Lease #005947; Igoe-Smith Oper. 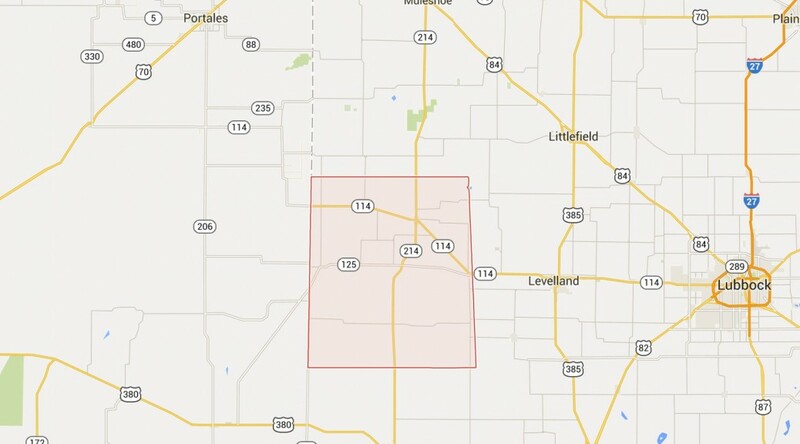 Area Oil Lease #005947; Mallet Oil Lease #018149; and North Central Levelland Unit Oil Lease #060557.